A new module from Carlson Software, Carlson Trench is for calculations related to installing pipes, sewers, or utility lines. The software calculates the volume of the trench cut, the volume of back fill (excluding the pipe size), and the linear footage of pipe broken down by the pipe material, size, and/or depth. Produces Trench Reports including Manhole Depth Summary, Pipe Length By Size, Stations Depth Summary, Structure Details, etc. Carlson Takeoff is available in two configurations: Takeoff OEM and Takeoff Suite. Takeoff OEM includes an AutoCAD® engine built-in and has all of the same ingredients as the Takeoff Suite, which works on AutoCAD® sold separately, or with IntelliCAD® built-in. The Takeoff Suite is comprised of the modules Carlson CADnet, Carlson Trench, and Carlson GeoTech combined with Carlson Construction. All are fully integrated with Carlson Civil and Hydrology to meet the variety of customers’ needs. New from Carlson SurvPC is the ability to work in the Esri® ArcGIS® system, yet with a familiar interface, achieving seamless accuracy in GIS. New functionality allows users to use Esri’s Map Objects to perform all survey functions with no downtime learning new software. In the new ArcGIS-enabled version of Carlson SurvPC, Esri’s Desktop can be used intuitively to perform all survey functions; ArcGIS points, lines and polygons can be used for staking. ArcGIS Nodes can be used for resections and localization; and users will be able to query GIS feature attributes at any time with the Store Points, Stake Points, and Map View screens. Import of MicroStation .dgn files and Import/Export of AutoCAD .dwg files is possible. Output to Excel for simple data management. From surfaces, screen entities, points on centerline, etc. 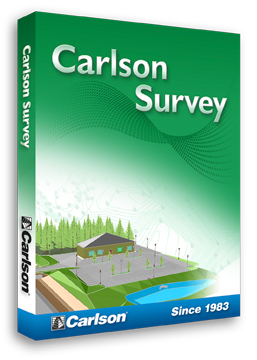 Carlson SurvCE is the first choice in data collection software, combining advanced functionality, ease-of-use, and sheer capability. Carlson Hydrology 2017 is here with the main new features including access to lookup rainfall amounts in NOAA Atlas 14, new watershed commands operated by grid files for watershed perimeters and runoff tracking, plus the option to draw out sewer lines just as a polyline before converting them in the sewer model. Hydrograph Editor – New command to edit time and flow data in a spreadsheet. Pipe Culvert Design – Added outlet control by gradually varied flow method. Utility Network – New command to define model for utility networks. Carlson GeoTech provides the ability to import borehole data for analyzing subsurface conditions and materials. Carlson Construction is an integrated cut/fill takeoff and 3D surface modeling software solution designed for site and road construction. It offers powerful inspection and 3D viewing tools for elevating 2D designs to 3D model files. Notable new commands in Carlson Construction include added methods to process, reverse the polyline, and to pick the point, plus added support for up to 7 subgrades, a command to color the surface TIN using the color assignments in Define Layer Target, and a method to apply textures to design layers in addition to the colors for viewing in 3D. The inherent completeness of 3D point clouds represents one of their major advantages over other sources of geometric information. Cyclone’s unique Object Database Client/Server software architecture provides the highest performance environment for laser scanning projects. Cyclone software makes it easy for users to manage data efficiently in databases. Users can work concurrently on databases, thereby reducing the need to copy and/or transmit large point cloud project files. Modern user interface with consistent look & feel and workflows throughout all modules. MAGNET Office design software is the best software solution for our customers. The ability to collaborate within your private, safe, and secure MAGNET Company Account places MAGNET Office software above the competition, but at an aggressively lower price point. MAGNET Office Tools is a cloud-enabled data processing software application that enables users to generate final coordinates from MAGNET Field, MAGNET Field Site, TopSURV, Pocket 3D files, as well as Topcon and Sokkia total stations, levels, and GPS raw data files. MAGNET Office Layout provides the ability to collaborate within your private, safe, and secure cloud-based Company Account. Don’t let is simplicity deceive you. This is a powerful yet “just what you need” CAD software solution ideal for small site design.